ELV has it on good authority that Michael Mina Pastry Chef Sarah Kosikowski will soon be nominated for a James Beard Award. That would be because we (along with many others) nominated her. To say her dessert creations are mini-works of art is an understatement. To say they taste as good as they look is something you’ll just have to take our word for — until you beat a path to her restaurant and taste for yourself. If ELV was forced to analyze these beautiful plates (something he has trouble doing in her presence as he’s usually too busy shoveling them into his pie hole), he would tell you her forte is comfort food gone very modern and very abstract. She blends traditional flavors and combinations with just enough molecular playfulness to keep things interesting for fussy food writers and avant garde aficionados. But the bottom line is: they’re complicated (lots of ingredients, lots of trios), but compelling to classicists and modern gourmands alike. All of her playful combinations are always in harmony, and (most importantly) they’re intense as hell (and yet another reason why we maintain Las Vegas has the greatest concentration of pastry talent in America). One thing is certain: once you’ve tasted Sarah’s Hitachino Red Rice Ale ice cream with caramelized puffed rice, Rogue Hazelnut Ale chocolate cake with Rogue Chocolate Stout foam and spiced hazelnuts, and apple beer apple strudel (all on the same plate); you won’t think about dessert the same way ever again. Sarahs desserts are true masterpieces. Good luck Sarah!!! Sarah’s creative twist on Carrot Cake is especially good-delicious to eat and stunning to look at. 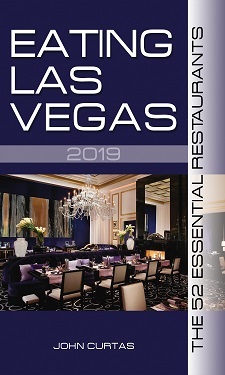 I’d like to encourage everyone to visit with Sarah in person in May when she’ll be doing a pastry workshop at “Vegas Uncork’d.” ELV will of course be highly involved. Let’s all be wishing for a James Beard Award for Sarah. Recently I dined at Michael Mina’s in the Bellagio and really enjoyed all the courses. The pickled red onions on my filet was a wonderful surprise. The dessert courses tasted as good as they looked. I was really impressed with the level of detail on how they where plated & the distinct flavors. Sarah has really explored some interesting ingredients. Her beer dessert is the most unique. This young woman is very deserving of a JB nomination. Congratulations to Sarah on her semi-finalist nomination for a James Beard Award. I have personally worked with Sarah on some food events and she always gives over 100 % of herself. Her energy, positive attitude, passion for food and beautiful smile is always a pleasure to see. I have my fingers crossed she will going to NYC.